With only one month to go before Glasgow introduces Scotland's first Low Emission Zone, Councillor Anna Richardson, Convener for Sustainability and Carbon Reduction has visited the British Heart Foundation's Centre of Research Excellence at the University of Edinburgh to hear how LEZs can help to tackle air pollution and bring about health benefits. During her visit to the Centre, Councillor Richardson met BHF Professor David Newby and Dr Mark Miller to hear details about their research around air pollution. 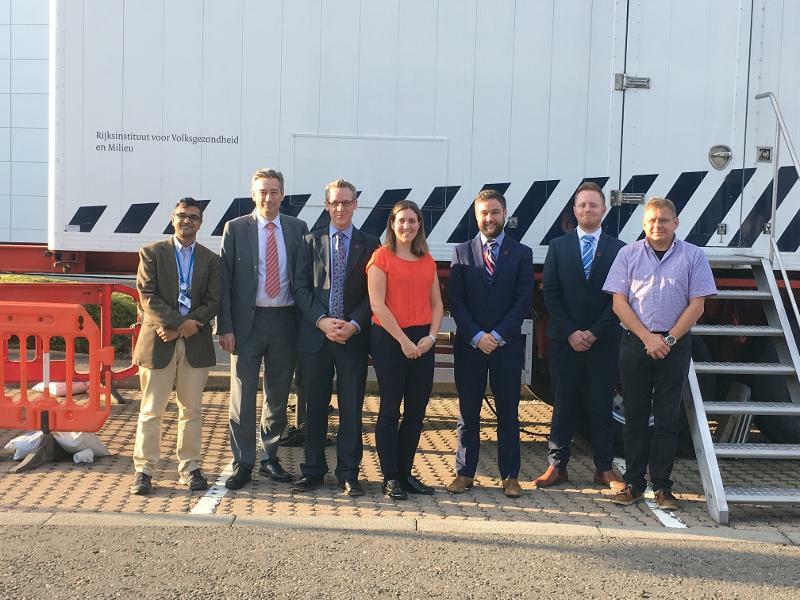 Councillor Richardson was also given a tour of the Clinical Research Facility and the Mobile Ambient Particle Concentrator Exposure Laboratory (MAPCEL) Unit which has been used by the BHF team to establish a link between areas of high pollution and heart attacks, and cardiovascular disease. Councillor Richardson said; "I was delighted to visit the British Heart Foundation's Centre of Research Excellence and it's been fascinating to hear more about their research and speak with their pioneering scientists. "Air pollution is detrimental to our health and we know it disproportionately affects the more vulnerable members of our society. Delivering cleaner air is therefore a priority for Glasgow and we're forging towards that by introducing Scotland's first Low Emission Zone by the end of the year. "By only permitting access to vehicles that meet strict exhaust emission standards, Glasgow's LEZ will help to reduce air pollution in our city centre, making it a healthier and more pleasant place to live, work and visit". Daniel Jones, Policy and Public Affairs Officer, BHF Scotland, said: "BHF Scotland is delighted that Glasgow City Council will deliver a Low Emission Zone in Glasgow by the end of the year. "Low Emission Zones have been shown to reduce particulate emissions, and international evidence has demonstrated that they have the potential to tackle poor air quality in a specific and set location. "In view of this evidence, BHF Scotland has long supported the introduction of Low Emission Zones in Scotland, with the aim of tackling air pollution across the country, and it is great to see that Glasgow is leading the way as the first Local Authority in Scotland to bring in a Low Emission Zone. "The introduction of Low Emission Zones across the worst polluted locations in Scotland has the potential to tackle the issue of air pollution to bring about real health benefits for local people, and we look forward to further Low Emission Zones being established over the next few years in Edinburgh, Dundee and Aberdeen." Low Emission Zones will be introduced in Scotland's four biggest cities between 2018 and 2020. Glasgow's LEZ will be phased in from 31 December 2018 and will initially affect local service buses only. By 31 December 2022 however, the strict vehicle emission standards required by the LEZ will apply to all vehicles wishing to enter the city centre zone. Click here to find out more about Glasgow's LEZ.